When shopping for diamond wedding or engagement rings everyone is looking for the same thing – something different! One way of adding a unique touch to a ring is simply to choose a different cut of diamond. It means you can still choose a classic ring design without compromising on individuality. 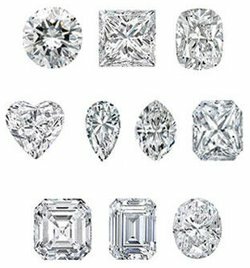 There is a lot of confusion about the difference between diamond cuts and shapes. Cut refers to the symmetry, proportioning and polish of a diamond, but not its overall shape. That’s not to underplay the importance of cuts –cut has a great impact upon its perceived brilliance, and poorly-cut stones will appear less luminous. Diamond cutting and shaping goes back to the Middle Ages, and several different cuts have been developed to make the most of each gemstone’s material properties. The cut is usually a symmetrical arrangement of facets that serve to modify the shape and appearance of a diamond. Cutters will consider the size and shape of the diamond before selecting a cut. Innovation continues in this area, as laser cutting and computer-aided design enable a new generation of cutting edge shapes with complexity and optical performance that hasn’t been seen before. Round Brilliant is the most popular shape for diamonds, and its facet arrangement and proportions have been perfected over hundreds of years through mathematical and empirical analysis. Today’s Brilliant cut produces an eye-catching sparkle and light reflection. 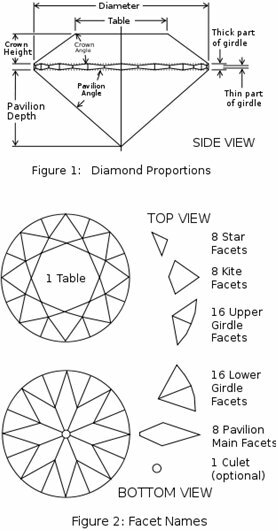 Diamond proportions and facet names, for the round brilliant cut. Figures 1 and 2 of  . Edited to omit brand names and other context. Copyright 2001 by Jasper Paulsen. Elliptical Oval diamonds started being manufactured around fifty years ago. The egg-shaped stones have 58 facets that enhance its visual appearance in terms of sparkle and light reflection. The rounded points on an oval-shaped stones can’t be easily chipped and damaged, and its round shape means it gleams unlike diamonds with many facets. Pear is also known as Teardrop, for obvious reasons. For this shape, one peak is sharpened while the other is curved. Pear-shaped diamonds work really well for pendants and earrings, as the shape looks very elegant hanging down. Pear diamonds can break easily if the jeweller has tapered-in the narrow side too much. Emerald is a gemstone as well as a rectangular gemstone shape that can be applied to diamonds. In this shape, width is twice length and depth is at around 60%. Radiant diamonds have a similar outline to an Emerald shape, with the main difference being the underside of the stone. 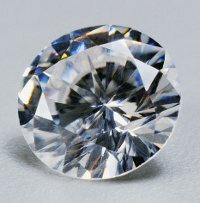 Radiant stones have more facets underneath that create more pronounced light refraction when viewing the top of the stone. The most romantic diamond shape is the heart, usually given as a Valentine’s Day or anniversary gift rather than as a wedding or engagement ring. The heart-shaped diamond has emerged from a pear or teardrop shape, with the curved end of the stone split in two. Princess is the second most popular shape of diamond. It looks like an inverted pyramid, with the wide end at the top of the ring. Asscher diamonds have similar facts to an Emerald diamond, but an Asscher ends up square with cut corners, instead of rectangular like Emerald. They appear Art Deco in design style, with the shape developed by the Assscher brothers from Amsterdam. Cushion or pillow shapes were very fashionable during Victorian times, and is making a comeback among those who love vintage style. They can also be known as “candlelight diamonds” as they offer a spectacular glow when placed near a candle. It’s a 58-faceted pattern in a rectangular or square shape. Triangular diamonds come fall under two categories; Trilliant are slightly curved while Trielle have straight sides. Trilliant diamonds have 31 facets while Trielle have 50, and are both symmetrical designs.